Thekchen Chöling, Dharamsala, HP, India – Youth Leaders from conflict zones met His Holiness the Dalai Lama for a second interaction this morning. The session began with His Holiness and two of the young leaders, Aluel Atem from South Sudan and Paula Porras from Colombia, participating online in an episode of ‘The Stream’, a social media community with its own daily TV show on Al Jazeera English. Aluel told The Stream that in their conversations yesterday, His Holiness had given her the answers she needed to her questions. Paula said that apart from being very funny, His Holiness had given her practical advice that would make her work easier. His Holiness expressed admiration for the confidence and warm-heartedness these young people reveal. He declared that even though he is growing older, he is determined to help them in any way he can, because young people like them are the future of the world. He was clear that the first step in establishing good communications with other people is to smile. “I don’t like formality,” he remarked, “There is no formality when we are born, nor when we die.” He joked about how some Chinese officials have referred to him as a demon, but made clear the respect he has for the Chinese people. Asked his view of the plight of the Rohingyas, His Holiness said it was very sad. 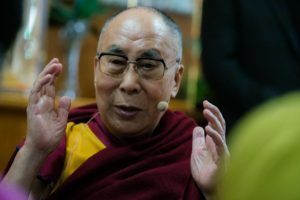 “When I first heard about what was going on in Burma, I suggested that when people or members of the army felt upset in connection with the Rohingyas, they should remember the face of the Buddha. I am quite sure that if he was there he would offer them his protection. “When Time Magazine had a photo of a Burmese monk on its cover with the caption “Buddhist Terrorist?” I realized that labels such as Buddhist terrorist or Muslim terrorist are wrong. When they engage in terrorist activities, people cease to follow the teachings of Islam or the Buddha—they’re just terrorists. “When I met Aung San Suu Kyi during a meeting of Nobel Peace Laureates I advised her that she should do something about what was going on. She told me that it was very complicated. Asked if she felt there was anything young people like her could teach the Dalai Lama, Paula suggested that they have an understanding and command of technology that enables them to exert change, for example through social media. For his part, His Holiness acknowledged that young people have fresh minds more accommodating to change, but insisted that it was valuable for younger and older people to share ideas with each other. Discussions between the Youth Leaders and His Holiness continued after the Al Jazeera episode, culminating in their all eating lunch together. His Holiness joked that it would be better for them to have their photographs taken together after lunch because their faces would look happier when their stomachs were full.